Whaddaya know, but the Crocs designers seem to be fresh out of ideas to extend the shelf life of their hideous footwear, which has been rapidly fading from the national fad-consciousness since early 2008. They want your help. Social networking may be the last refuge of the 21st Century scoundrel. Case in point: Crocsideas.com! Pulling the laziest designer trick of lazy designers everywhere, Crocs wants you to help them make their shoes into something half-decent. In the nauseous language of corporate prosumer sites everywhere, you can Join The Community, Post An Idea, and View & Vote (on the Community's Ideas). You can Share, Listen, and Innovate. Isn't that sweet? Crocs wants you to tell it exactly what you think of it! And maybe to suggest what it might do that would be worth buying. If crowd-sourcing its product development seems like scraping the bottom of the barrel, that's because it is. It wasn't always this way. When the company went public in 2006, it raised $208 million, and had the biggest stock market debut of any footwear company since people have been wearing shoes. One feverish day in October, 2007, the stock price hit $74.75. Various people have debated what this early-oughts vogue for spongy, candy-colored clogs meant, tying the trend in to America's deep desire for comfort in the aftermath of 9/11 and in the run-up to war ("America wanted a shoe that nurtured it, cradled it, made it feel warm and safe and loved...they quickly became the bacteriostatic security blanket for our souls"), or making them into cheap and cheerful symbols of the now-passed economic boom. The reversal came swiftly. The company lost $181 million in 2008; it scrambled to service its debts, and laid off 2,000 employees. People stopped just buying them; attempts at branching out into Crocs clothing and Crocs cell phone holders and those idiotic Crocs hole charms, never caught on. (CEO John Duerden says the company was caught in "a perfect storm.") What happened to Crocs calls to mind those animals who evolve so perfectly to meet certain niche conditions that they find they can tolerate no others, like those amphibians who die in the South American jungle when the water level of their stream rises an inch. Crocs had one good idea: making cheap, funny looking but comfortable clogs in a cute array of colors, suitable for people who wanted to make a statement about caring more about comfort than about making statements. Unfortunately, the perforated foam rubber clog was widely copied by cheaper imitators, the fad blew up, and the market went away. 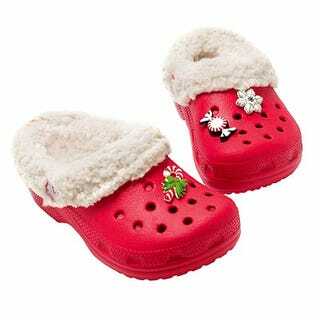 Everyone who wanted Crocs, had them. The stock is currently trading at around $5.31, which is not quite its all-time low. They had "no-slip soles and a secure upper," says Margaret. "You know, like actual shoes. My mom owns a pair (which, thankfully, she only wears while gardening) and I slipped them on last week when I was going to get the mail. I tripped and almost fell on my driveway." Take away the holes, says Hortense, who noticed the company pushing holey clogs for winter wear. "NOBODY wants holes in their winter shoes. They look cheap and stupid (and not to mention cold and drafty)." I say they should take a cue from, you know, every other shoe company on earth — even the ones who might have had less successful IPOs! — and make a better array of styles. Croslite, the proprietary foam that Crocs are made out of, is actually kind of a cool material: it's lightweight, it's waterproof, it doesn't absorb sweat or odors, and it molds to the wearer's foot under body heat. So why is it only ever used for ugly clogs? Why not make sandals? Jellies? Flip-flops? Think minimal, not clunky. Jesus, do we have to draw you guys a picture? Is there any way we could get a pet line out of this? Otherwise, we may have to break out the big guns, and think rebranding. Instead of Crocs, the cuddly Millennial shoe, why not be Sharks? Oh, wait, somebody did that.